After the Lok Sabha elections, the Modi magic was still at work. He was forgiven for all the unprincipled positions he took. 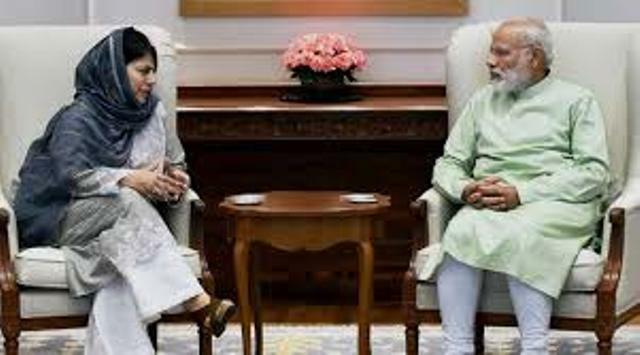 That he never intended to deal with J&K on Atal Bihari Vajpayee’s stratagem of Insaniyat, Jhamhuriat and Kashmiriyat is apparent from the slew of unfulfilled promises. For him, the alliance presented a golden opportunity to further his Hindutva agenda, J&K being the ideal testing ground. The BJP was always aware that the Muftis would be soft on terror. What the BJP has done is much worse: They have played politics with terror. The Agenda for Alliance (AoA), in retrospect, was an act of betrayal. The AoA promised “reconciliation and confidence building within and across the Line of Control (LoC) in J&K thereby ensuring peace in the state”. Just the opposite happened. The state is in turmoil with a large section of Kashmiris in the Valley feeling alienated. Along with terrorism being bred and encouraged from across the border, its domestic seeding is a reality today. Contrary to promises in the AoA, neither has the ambit of democracy widened nor has inclusive politics been given a chance. The alliance also promised to create conditions for the resolution of all issues of J&K. If anything, governance in the last three years and three months of PDP-BJP rule has added to the woes of the state. The reconciliation of differences and sustainable economic development were to go hand-in-hand, for one was not to succeed without the other. Instead, lives have been battered and large sections of those living in the line of fire along the LoC displaced. Fomenting trouble in Jammu by victimising the Bakherwals, a nomadic Muslim community, and that too at the hands of those who were ministers, is hardly an attempt at reconciliation. The tragic incident at Kathua and its politicisation shows up the real face of the BJP. The most telling example of the BJP’s double-speak is the assurance given in the AoA that despite differences in perception, “considering the political and legislative realities, the present position will be maintained on all the constitutional provisions pertaining to J&K including the special status in the Constitution of India”. Yet both the special status enjoyed by the state by virtue of Article 370 and the abrogation of Article 35A, which provides for special protection to permanent residents of J&K in the matter of owning property, permanent employment in jobs in government and public sector enterprises, became intensely debated public issues with the prime minister maintaining a stoic silence. All that the attorney general allegedly did in proceedings in the Supreme Court was to describe the issue as sensitive and seek postponement of the matter for a larger debate and for the Union to address the court on the constitutional validity of 35A. With the breakdown of the alliance, the Union will again polarise the state through proceedings in court. On Article 370, the BJP in the run-up to the 2019 Lok Sabha elections, will reiterate its position for its abrogation, as was done in 2015 by a BJP member of Parliament seeking a debate on the issue. One wonders at whose instance petitions are filed in courts to raise such contentious issues and that too always before an election. Those who understand the motivations of the present dispensation don’t have to struggle to find an answer. The AoA was also committed to support and encourage initiatives to “create a reconciliatory environment… for peace and development within the sub-continent”. Also to “help initiate a sustained and meaningful dialogue with all internal stakeholders . to build a broad-based consensus on resolution of all outstanding issues of J&K”. The outcome was the obverse of the commitment made. Dialogue with the Hurriyat was shunned. None of the other stakeholders were approached. The report of the three earlier interlocutors was discarded with the new interlocutor invisible since his appointment. Instead, the muscular Indian state cracked the whip and ferreted out terrorists to snuff out militancy in the Valley. The killing of Burhan Wani was a turning point, after which incidents of terror have increased manifold. There has been a 64 per cent rise in terror-related incidents during 2015-2017 over the period 2012-2014. Instead of reconciliation we saw unabashed confrontation. Development was sacrificed at the altar of teaching militants a lesson. The result: The Subcontinent is in a state of frenzied uncertainty. Insecurity prevails, the development agenda has been overshadowed and social and humanitarian initiatives, all promised by the AoA, in rigor mortis. For the architect of the AoA to blame the PDP is part of a larger design. With 2019 round the corner, a polarised J&K will add fuel to the fire, the centrality of the BJP’s communal agenda. The writer, a former Union minister, is a Congress leader.